My recent article on preventing bears and critter issues had as its primary piece of advice a simple tenet: Try not to camp in popular campsites if possible. Trash? Fire ring? A significant amount of impacted ground? Do not be surprised if something pays a visit in the night. Bears are usually a minor issue…rodents are more likely to be a problem. 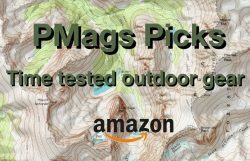 After the bear/critter article, I received emails and comments asking the best way to pick a site and if long trail data books had ALL the campsites. First, any resource is not going to have all the possible sites. Too many variables in group size, shelter size, what a person considers a good site and so on. 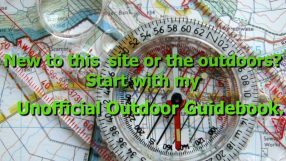 Also, in a place such as a national park, you have to use the site that is available and designated by the backcountry office. Site selection will be limited as to what you can choose. So, having said all that, here is some advice for finding a suitable campsite. Look at your map and see what would be a good spot. Looks flat? In the trees if possible? Or is it an exposed meadow? Near water? Many beginner backpackers love to camp in a wide open meadow. The problem with camping in a wide open meadow is that the meadows are usually in a valley (cold air sinks), prone to moisture and dew, and often near bodies of water, too. The place will be colder, wetter and possibly insect prone. Camping in the trees helps protect from the wind, can be a little warmer, will often have ground cover (more comfortable sleeping; adds R-value to your sleeping pad) and so on. And while camping near a lake can be excellent from an aesthetic standpoint, there are similar issues to camping in a meadow. Plus so many people love to camp near a lake that these sites are often well-known to various creatures. So, to get a good campsite, use a map and get a broad overview when planning a campsite for the evening. Once in the general camp area, time to perform micro-navigation. If possible, try not to camp at the absolute highest or the absolute lowest point in the general area. Too high and you are exposed to the wind. Too low? Again, cold air sinks. Don’t be at the bottom of a runoff as rain does go downhill. Do not camp near a “widowmaker.” Obviously do not camp where there are lots of roots, rocks, and other debris. A good campsite for me would be in the trees, some ground cover and possibly a small, fast flowing stream 200+ feet or more away (Not always needed. See DRY CAMPING below). At the edge of a meadow or treeline is where I’ve had some memorable campsites that fit these criteria. We dry camped here. We saw no one. Speaking of being 200+ feet or more away, do not be afraid to be out of sight and away from the trail. Besides being suggested per LNT guidelines, your chances of finding a non-popular spot are excellent if you go a little bit off-trail. Be sure your chosen site is a sustainable one. Do not camp on fragile or protected areas. If in a larger group, disperse if feasible. Grabbed water and camped further up the canyon where there was no water. Nothing wrong with dry camping either. 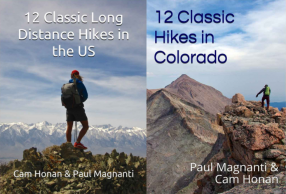 See an excellent campsite on the map that is two miles from the last water source? No worries. Because you have a map, you know you can grab water at the stream crossing, (perhaps make dinner by the stream?) hike two miles and have five or so miles until another stream crossing the following day. Animals, be they the four-legged or two-legged kind, congregate near water. Dry camp? Less likely to have rodents nibble on the Snicker bars and you will have solitude as well. On the increasingly crowded Pacific Crest Trail, dry camping may be a good strategy to enjoy a scenic desert view without everyone crowding around a water source. Camped right at the cusp of treeline. I saw elk bugling on the ridge above and had a herd of elk run by my campsite. Awesome! Great campsite info, Mags. Thanks for drafting it so carefully and posting it. Big help to many. Thanks Bill! It was my pleasure. If you are looking for a campsite in the dark, it’s often possible to see where the humidity is high. In the beam of your lamp the air will be filled with mist. Continue walking until the air in front of you becomes clear.